Buy Premium food grade Diatomaceous Earth! Not all Diatomaceous earth is created equal. Of all of the mines only 4 in the USA are classified as food grade which is safe and reliable for human consumption, home and ranch use. Many deposits are not of good quality or purity, containing large amounts of clay or other contaminants. Anything labeled Pool Grade is toxic and should be avoided. Pool grade diatomaceous earth is super heated and chemically altered. Food grade should be labeled as such an the ingredient list should tell the story that it contains only Diatomaceous Earth or Silica or Silica Dioxide. The Health Ranch, Diatomaceous Earth is of the purist quality, and meticulously mined from the best ancient freshwater deposits. Diatomaceous Earth is a natural mineral consisting of 89% Silica Dioxide and about 14+ trace minerals depending on the deposit. It is formed from a plankton like creature called a diatom, called the meadow grass of the sea, which builds an intricate cylindrical shell around itself by pulling the minerals from the water. The diatom lives only 6 days, dies and falls to the bottom of the lake. Innumerable amounts of diatoms leave a thick layer of silt at the bottom of the lake. These ancient dry lake beds are then mined for the thick deposits of diatomaceous earth, a white, powdery mineral. Diatomaceous Earth is premium quality, completely organic, is OMRI listed, non-toxic, Safe, natural, odorless, tasteless. It is truly Nature’s Amazing Fossil Mineral! Feed lots, stalls, calving sheds, hog barns, milking parlors, and dairy’s can benefit from Diatomaceous Earth unique odor neutralizing capacity. Because diatomaceous earth is so porous, with a high surface area, it traps noxious odors, as well as drying out wet, mucky conditions. Spreading diatomaceous earth on manure piles is also great for composting! Mineral supplementation has been proven to produce shiny coats, healthier hooves, faster weight gain, sweet, rich milk for lactating mares, strong bones and teeth, and healthy nervous systems. Ample research shows the sheer necessity of supplementing all livestock with quality minerals and trace minerals. However, many mineral products contain fillers, some GMO corn or soy which has been shown to block mineral absorption. Others contain incomplete, synthetic vitamins, that physiologically deplete an animals system instead of supplementing it. Most animals are forage animals and anyone who has been around animals in a natural environment has witnessed animals seeking out certain areas where they eat the dirt. Herd animals especially need natural forage minerals, where pasture, holding pens or overgrazing has depleted or deprived them of their natural instinct to obtain these needed minerals. Consider adding Diatomaceous Earth to your herds mineral program. Can be given free choice or mixed with feed (not to exceed 2% of total ration). Diatomaceous earth has been proven to increase calcium and magnesium uptake, adding it to your mineral program may decrease the incidence of grass tetany. Healthy, Strong, Vibrant, Shiny, Bright Eyed, Productive Animals! Green, Simple-Organic Barn and Animal Life! Nature’s Amazing Fossil Mineral! Completely safe for ALL horses, cattle, camelids, sheep, goats, swine, dogs, cats, rabbits, chickens, exotics, birds, reptiles and small caged rodents. 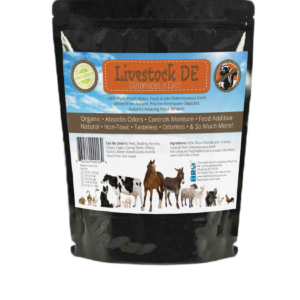 Livestock DE is a bedding booster, that naturally prolongs and enhances your livestock/pets bedding/litter. Keeps bedding dryer-longer, fresher! “I started using Livestock DE when I rescued my horse who had a bad infestation that the vet couldn’t figure out. Not only did it clear up his skin condition, I now use it on my chickens, turkeys, plants and I can go a lot longer between cage cleanings on our house bunny, no smell! I use it for everything! Chrissy T.
“Started to dust my horses this last spring with Livestock DE! Wow, does this stuff work great! No ticks, seems to act as deterrent too. We started feeding it free choice to our horses out in pasture, they love it! I could tell the first week they were really deficient, because they wouldn’t leave it alone. Our horses are healthier, shinier, have stronger hooves and more contented. Once I started to see the benefits, I use it all over the barn, it economical, safe, and love that its a natural choice.” Maureen K.
**Horses and Ruminants can be feed Free Choice. Put in a weather protected area so it doesn’t blow away or wash away, and let livestock choose amount needed. Can be mixed into other mineral supplements or dusted onto hay. Diatomaceous Earth is an anti-caking and feed flow agent, and feed additive not to exceed 2% of ration. Disclaimer: This information is for educational purposes only, it is not a substitute for a physician or veterinarians advise. These statements have not been evaluated by the FDA, this product is not intended to diagnose, treat, cure or prevent any disease. Any food chemical codex uses of Diatomaceous Earth other than those approved by the EPA, FDA, or USDA are based on others reports.